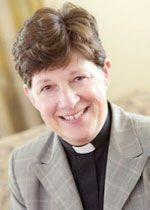 Editor’s note: This is reprint of ELCA Presiding Bishop Elizabeth Eaton’s column from July 2014. Just as she did at the 2016 Churchwide Assembly, Eaton encourages people to “dust off” their Small Catechism and take another look at the basics of our faith as we near the 500th anniversary of the Reformation. We do have a history of communicating the faith from generation to generation. Martin Luther wrote the Small Catechism after the Saxon Visitation of the late 1520s, which examined the religious practices in the parishes of that part of Central Europe. He discovered a stunning lack of understanding of the basics of the Christian faith among laypeople and pastors. So in the Small Catechism he gives a concise but rich explanation of the Lord’s Prayer, the Apostles’ Creed, the commandments, baptism, communion, the Office of the Keys and confession. The Small Catechism became an important part of faith formation in families. Millions of us throughout the centuries and world have studied and memorized it. Catechism has been a rite of passage in the Lutheran movement. It could be argued that no other experience is more universally Lutheran than studying this little book—not language, not hymnody, not cuisine, not worship style. “What does this mean?” and “This is most certainly true” are two of the most recognizable phrases in Lutheranism. It’s been said, “Youth is wasted on the young.” I’m not suggesting that studying the catechism isn’t beneficial to middle school students. But confining catechetical instruction to that age group and expecting fully formed disciples at the end of the process is probably a little unrealistic. Some argue that emphasizing our Lutheran identity is an impediment to dialogue and evangelism. I would argue that if we aren’t clear about who we are and what we believe it’s not possible to have deep and authentic encounters with others. It’s hard to have meaningful give-and-take with mush. There was a time in the 1980s when church growth experts urged us to shed denominational identity in favor of more generic, and so appealing, names for congregations. St. Paul Lutheran Church became the Church at Pheasant Run. It’s like selling our inheritance for a mess of marketing pottage. Of course we are baptized into the one, holy, catholic and apostolic church. Of course our identity is in Christ and not in a 16th-century Augustinian monk. But there is something distinctive about our Lutheran voice that needs to be heard in ecumenical and interreligious conversations and in the public square. If we aren’t clear about this we run the risk of sliding into relativism. It might be time for all of us to dust off our Small Catechisms (or find it in Evangelical Lutheran Worship, 1160) and take another look at the basics of the faith. Staff at the Lutheran Center in Chicago will be doing just that this fall. My guess is that places like Microsoft or McDonald’s take great care in immersing their people into their corporate culture. We are Lutheran Christians. With great humility we can be unapologetic about being Lutheran. It would be wonderful if we as the ELCA prepared for the 500th anniversary of the Reformation in 2017 by studying the Small Catechism together. We have a common language with which to talk about faith, engage Scripture and make sense of our world. Catechism is not just for the young. This is most certainly true.